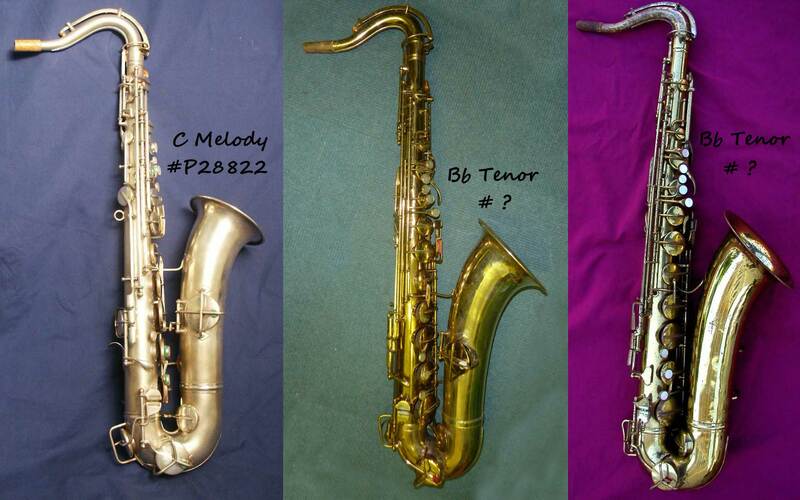 Home Articles How Can You Tell A C Melody From A Bb Tenor Sax? 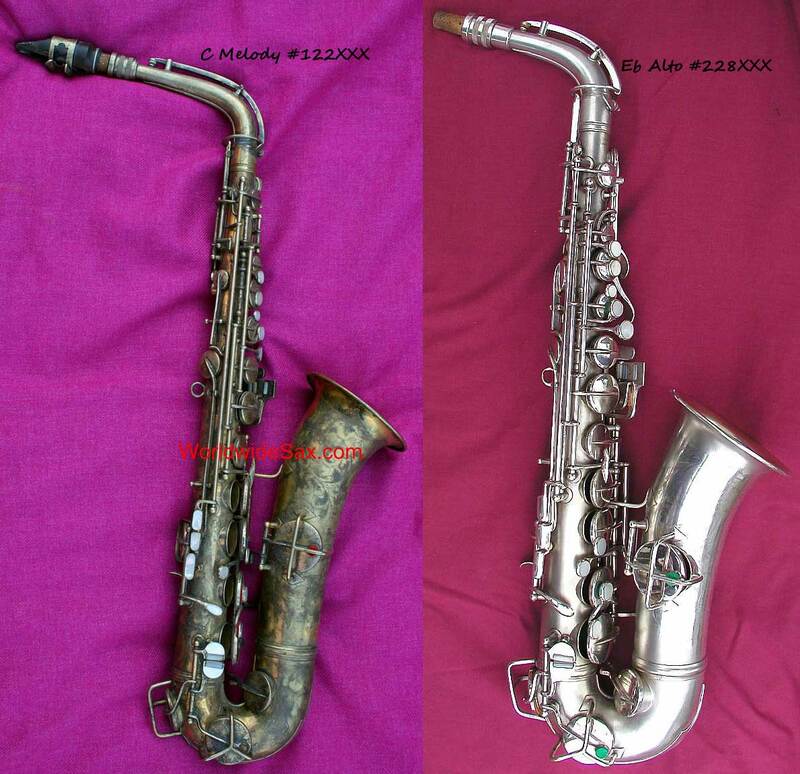 It’s happened to quite a few saxophone buyers on eBay: they thought that they were buying a vintage tenor, but when the saxophone arrived, it turned out to be a C melody instead. This raises the question: How can you tell a C melody from a Bb tenor sax? This is especially true if you are buying your horn unseen; based on photos only; most likely online. The best way to tell if the horn you are considering buying is a C mel or a Bb tenor, is by its size. A tenor is longer than a C mel. The image below is not a true C melody, but rather a C pitched tenor made by Adolphe Edouard Sax. It does however, demonstrate the size differences between C and Bb pitched saxophones of the same voice. The general rule of thumb is that the body tube of a C melody measured without the neck is approximately 24″ long. The tenor is of course longer. The problem is that many sellers on eBay don’t know a horn’s neck from the mouthpiece, which will make it very difficult to believe anything they say about measurements. This potential confusion is what led me to write this article on how you can tell a C melody from a Bb tenor. By looking at the differences between the various brands, hopefully this will give you a pictorial guide when shopping for your vintage tenor, or trying to ID one you already have. How can you tell a C melody from a Bb tenor if it’s a Martin? The Martin C mel comes in at about 24″ in length from the socket to the end of the body tube—minus its bow guard. The location of the chromatic F# key. 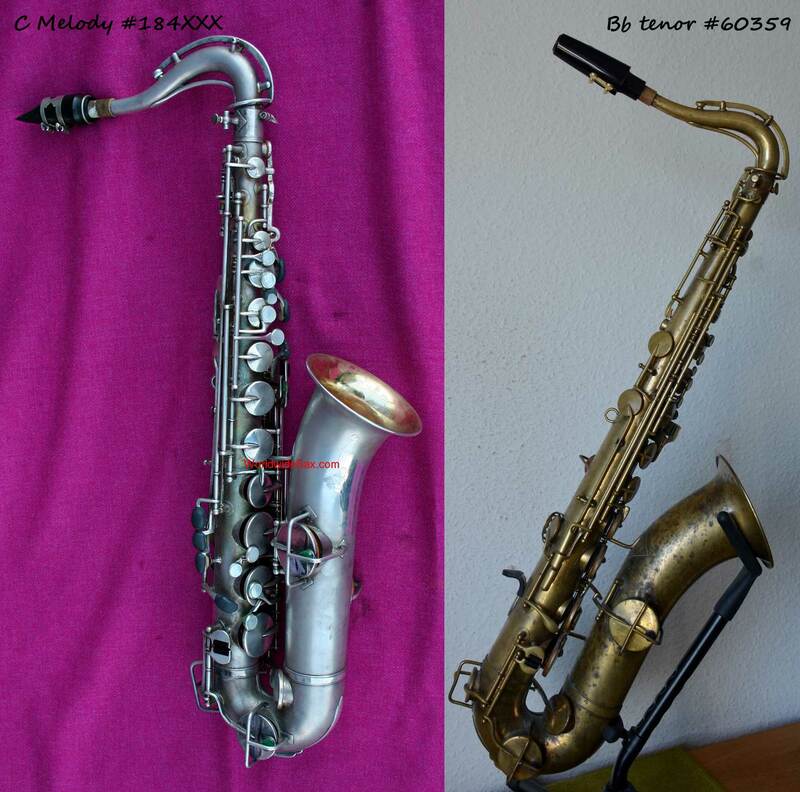 Below are photos of a King C melody (left), and Bb tenor (right). Unfortunately because they are from two different sources, the tenor appears nearly the same size as the C mel, but trust me, the horn on the right is in fact larger. How can you tell a C melody from a Bb tenor if it’s a King? The C melody will be around 24″ in length from the socket to the end of the body tube—minus its bow guard. The bell on the C melody points more upward, while on the Bb tenor it points more forward. This is also noticeable in the H.N. White catalogue pages below. The distance of the bell to body brace from the end of the bell is greater on the tenor than on the C melody. I was fortunate enough to be able to find these old catalogue pages from H.N. 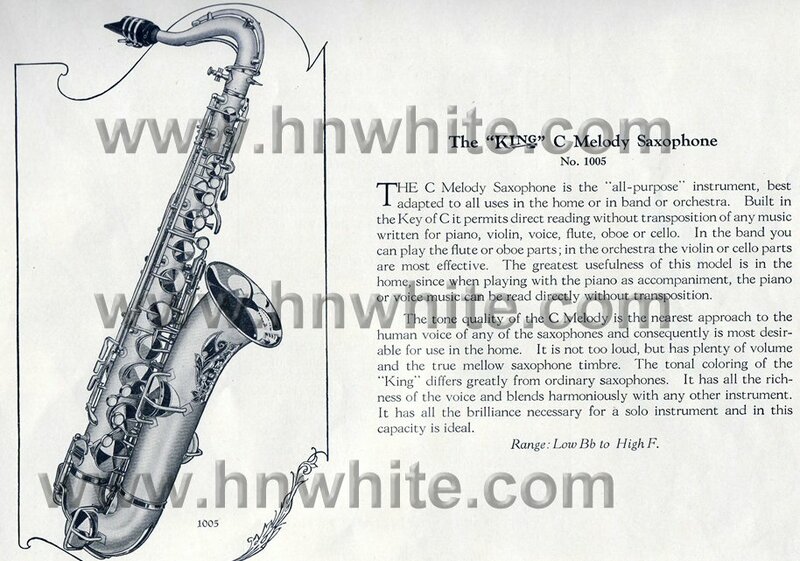 White that describe the C melody and Bb tenor saxes. These give us an idea of how the horns were marketed during the height of the sax-happy 1920s. Below are photos of a Buescher True Tone C melody (left), and Bb tenor (right). How can you tell a C melody from a Bb tenor if it’s a Buescher? The C mel has it located around the back, while the tenor has it on the side of the horn. 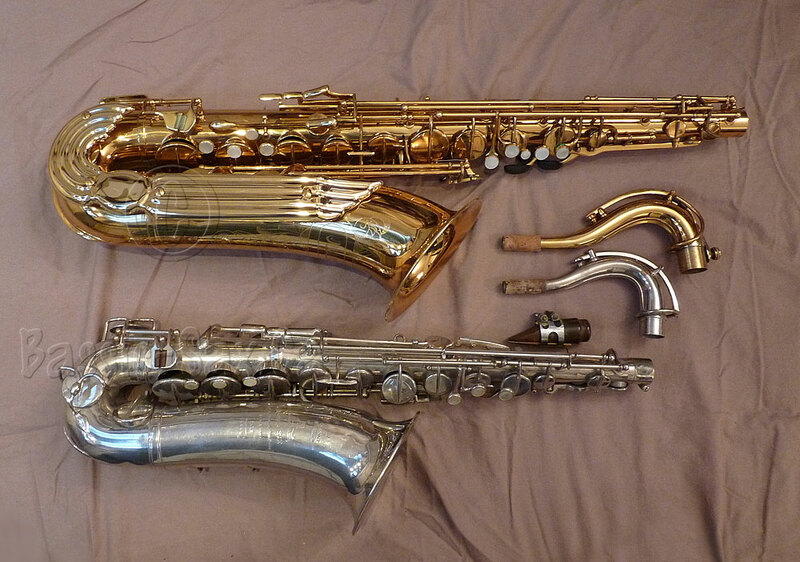 Conn built two styles of C melody saxophones—an alto and a tenor version. Generally speaking, the alto-style is more desirable, and tends to sell for more money. Some people also state that they were the “professional” models of the two . Although I wouldn’t go that far, I can tell you that mine is built like any New Wonder was at the time. Meaning, they were built to the level of all of Conn’s other professional saxophones ATT. Since I don’t own, nor have I played a tenor-style C mel from Conn, I won’t make any statements about the build quality or playability of those horns. Below are photos of a Conn New Wonder Tone C melody (left), and Eb alto (right). How can you tell a C melody from a Bb tenor if it’s a straight-neck Conn? The C melody will be around 24″ in length from the socket to the end of the body tube. Although perhaps hard to tell in the photos above, the neck of the Conn C melody is significantly longer than that of the alto. In the photo below you can see its length compared to that of an alto of the same model. According to the measurement that I have taken of my C melody, the neck of straight neck Conn is approximately 9″ long (23cm). Below are photos of a Conn New Wonder Tone C melody (left), and Bb tenor (right). How can you tell a C melody from a Bb tenor if it’s a goose-neck Conn? The bell on the C melody points more upward, while on the Bb tenor it points more forward. 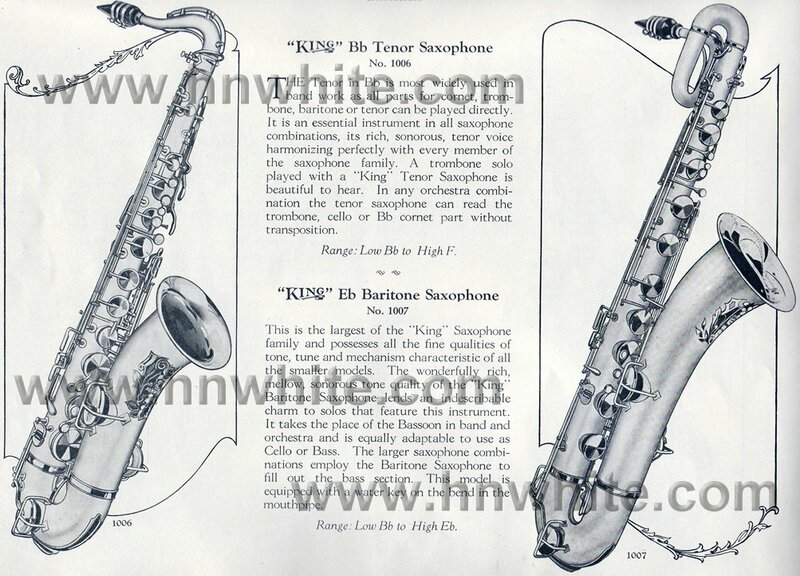 This is much like the design of the King saxophones shown above. On the C melody the key arm is considerably shorter than on the Bb tenor. Pan American was Conn’s second-line instrument. Second-line horns are really student or intermediate level horns made and sold by major saxophone manufacturers under a separate name. You can argue amongst yourselves if Pan Americans are student or intermediate level horns. I can tell you that my curvy isn’t built like a student horn. Period. Full stop. As you can see from the photos below, the Pan American line changed over time, and the keywork shared less in common with Conn’s pro line of horns. I have not been able to find any Pan American C melodies from the later period. I am not sure if Conn built any under the Pan American name at all, or if I just haven’t been able to find any. 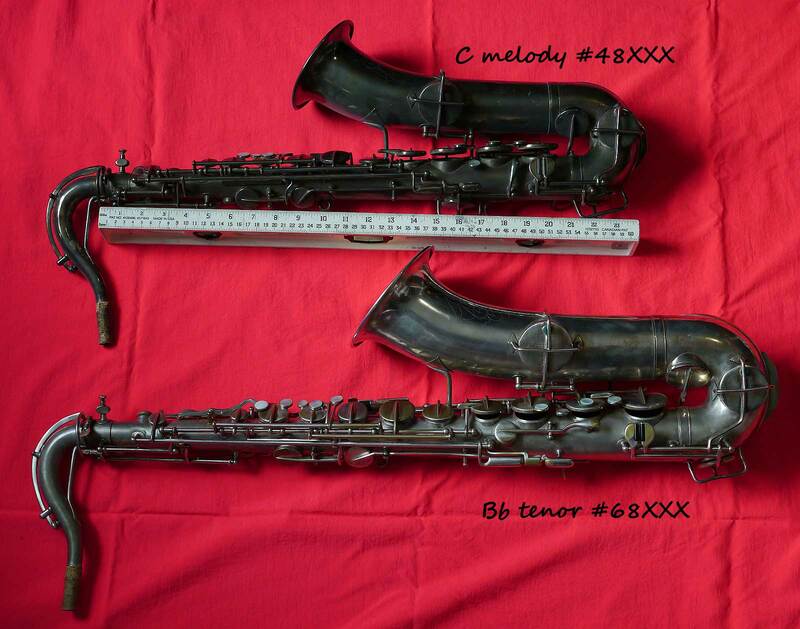 Below are photos of a Pan American C melody (left), a similar era Bb tenor (middle), and a later model Bb tenor (right). How can you tell a C melody from a Bb tenor if it’s a Pan American? Just like in Conn’s name brand instruments, the bell on the C melody points more upward, while on the Bb tenor it points more forward. This is much like the design of the King saxophones shown above. The key style on later-model is quite different. As noted above, I have not seen any C melodies built during the era that have this shape of chromatic F# and right pinkie keys, as well as the left pinkie cluster. I have also not seen any C melodies with left-sided bell keys. So how can you tell a C melody from a Bb tenor sax? By now I hope you realize that regardless if you’re dealing with a King, Martin, Conn, or Buescher C melody, or even a European C-pitched tenor, the one consistent difference between the a Bb tenor and a tenor saxophone pitched C, is SIZE. A horn pitched in C will generally come in at around 24″ in length from the top of its socket to the bottom of its bow—minus any bow guard. 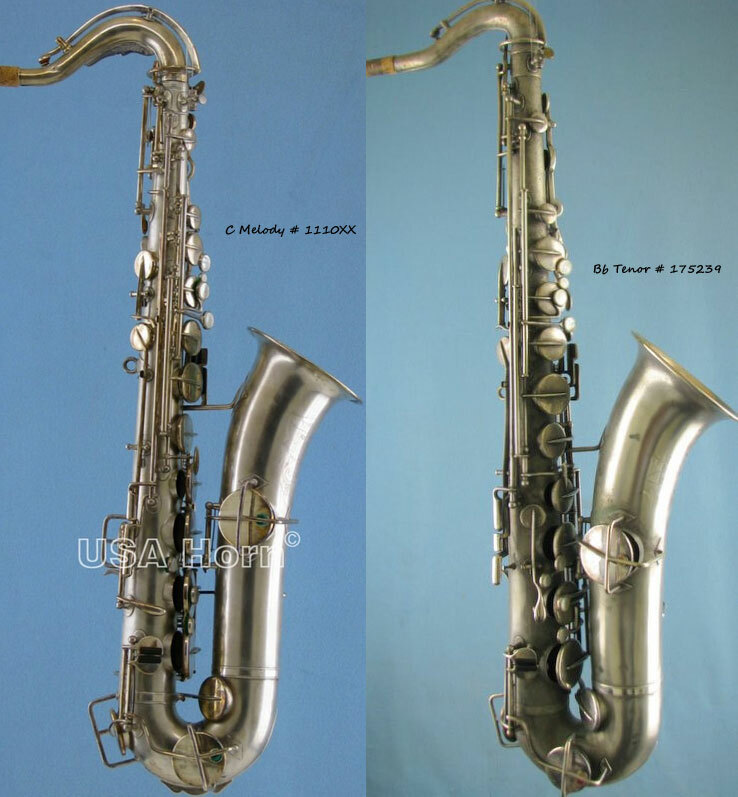 If you are buying a horn online, and want to make sure you are not buying—or are depending on what you’re looking for—a C melody saxophone, that is the surest way of getting what you’re looking for. 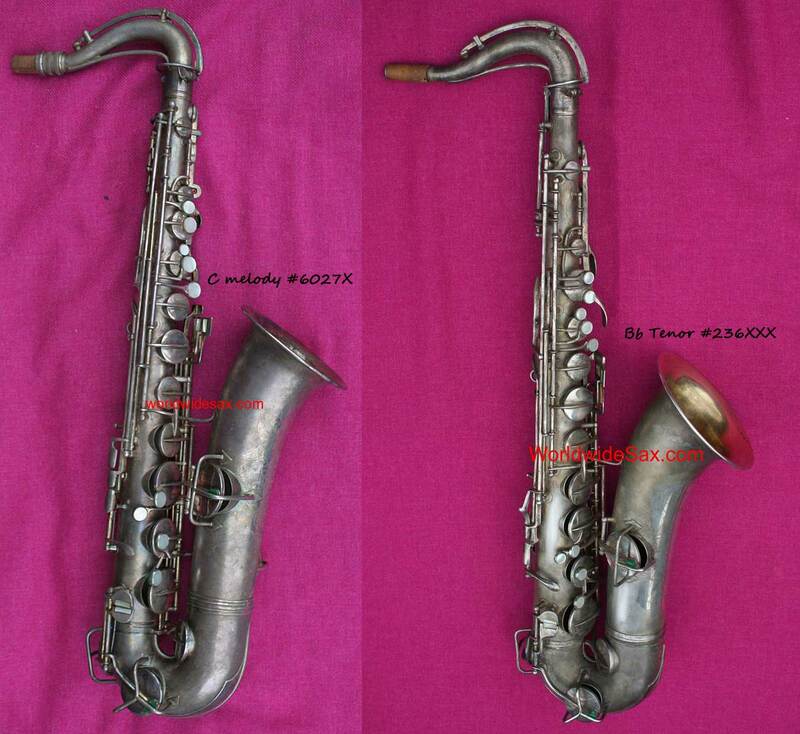 If you are interested in a sax you see on eBay or other online source, and you have doubts if it is a C melody or Bb tenor, get the seller to take a photo of the body with a yardstick next to the body tube. That will tell you all you need to know.